IamJenniya: My Hubby's Shirt as Dress? My Hubby's Shirt as Dress? Sometimes, my brain is not working (well, not literally or else I'm dead now). So, when I cannot think of any to wear, I just pull some dress out from my closet. Dress saves me when outfit dilemma attacks. With the dress, I will not think of what top or bottom that needs suiting. I know I am very late to get into boyfriend shirt bandwagon but I think I need to post how I wear my husband's shirt. No, I'm just kidding. It is not his. It is solely owned by yours truly. This is what I wore when we collected our pay check in Ortigas Center last week. Since it is the only appointment we had, I planned ahead to take the chance of the free time after. 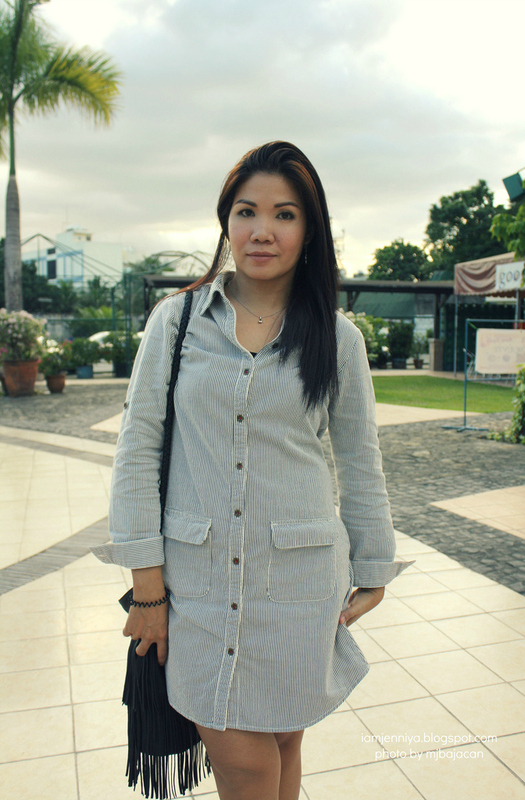 We stopped by at our favorite place for outfit shot somewhere along Shaw Boulevard. You will be fooled in the first glance with this shirt dress. You would really think I borrowed this from my husband. But if you'll take a look at the pockets, it was designed just below the waist and not in the chest area for you to think over that this is actually made as shirt dress for women. I also love the fabric. It weighs like a bit of denim jeans but lighter, so definitely this is a thick fabric that will keep me warm also. It has also an option to fold the sleeves to 3/4's or just lay it down depends on my mood and of course, the weather. 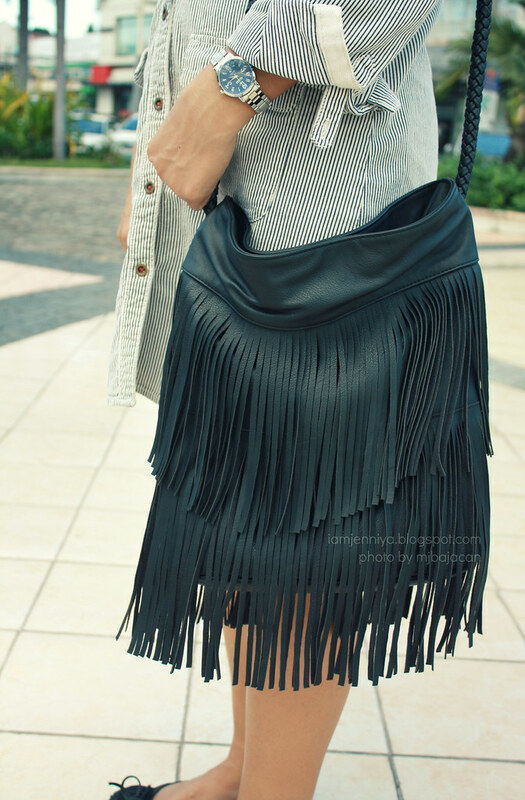 I paired my shirt dress with this fringe leather bag. I don't know what came to me but this bag is shouting like "pick me! pick me!" from the rack. Hence, the boho kind sort of outfit was the result. I also picked this black flats to pair with my fringe bag. We really missed the sundown shots but we took few shots only as I am under whitening program for my face. Lol! Just kidding again. I am just so hungry that time but every time I turn my back heading to the nearest establishment to eat some, my hubby would call me saying "last shot" and click the camera again and again. Hmm... I think I am lucky to have a hubby that enjoys taking photos of me. (Huge grin). Wow you look great! Especially love the bag! I love your blog! Specially the photos because they are so detailed and clear, I can really understand about your post. I followed you back on GFC and on BlogLovin'! 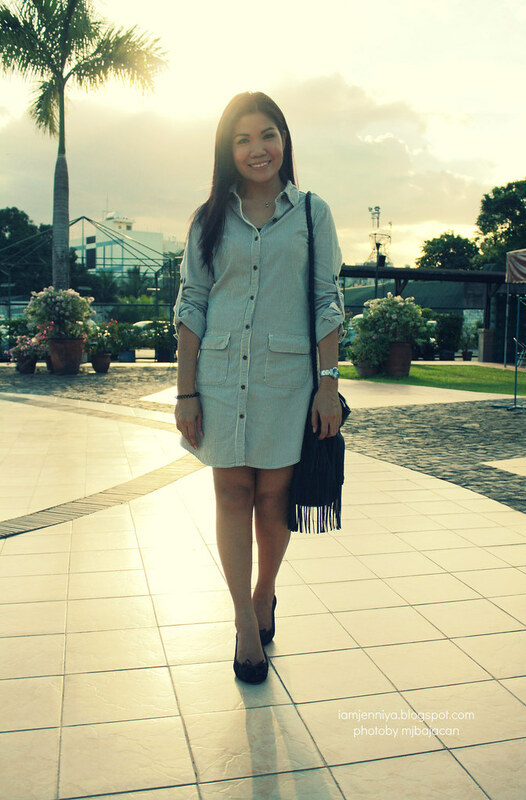 Thank you for dropping by my blog earlier to check out my site :) Thank you for this post! I can't wait to read more of your posts. More power to you! i love this kind of outfit! love your blog-i followed! would love you to check out mine! 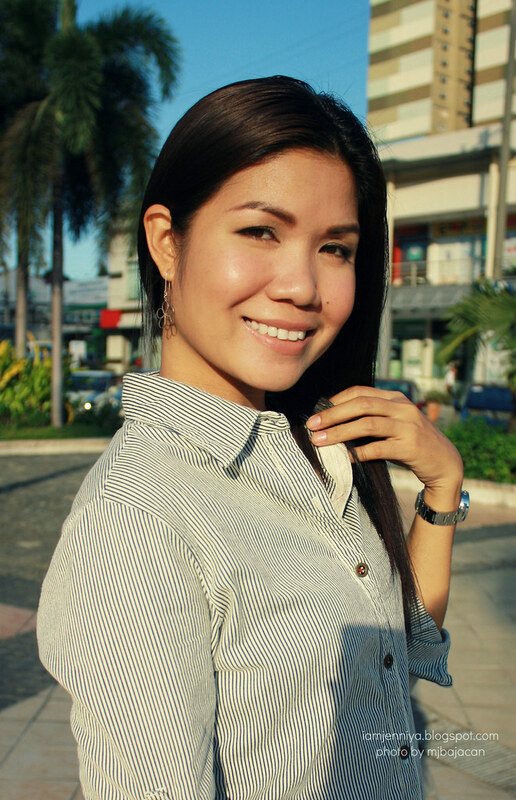 hi Jenniya, thanks for dropping by in my blog. you have a lovely blog and stunning style. Love your shirt dress:)! Would you like to follow each other? Just leave me a comment on my blog and let me know! Thanks:)! I'm following on GFC, Bloglovin, and FacebooK:)! Thanks so much for your lovely comment on my blog. I really appreciate it, that's why I comment on your post twice! Of course I'm following you back; hope we can keep in touch! lovely shirt/dress , I like hoy you paired with the fringe bag. following back on gfc and bloglovin ......did you have problems with bloglovin or gfc? nice borrowing from the husband closet! I was about to say! I wish my boyfriends shirts looked like your husbands. This is an awesome outfit and I'm loving the fringe bag. Looks greart and comfy))) Thanks for sharing such a nice post! I'm following you right now, hope you will do same! Lovely! When I don't knowwhat to dress I just use jeans hahahaa BTW, following you back! Lovely idea, it works well! oooh! what a nice smiling girl (: you look beautiful in this lovely outfit! looks like it's summer in the place you live! Wow I love your shirt dress!!! That is such a great dress, it looks fabulous! I'm really lusting over your bag!!!! I love your dress you look beautiful and I'm really lusting after your bag!!!! you are adorable and i love the dress! comfy and chic! You pulled off your hubby's shirt well! I, however, won't pull it off..It'll be too short on me. Perhaps I could wear shorts underneath and wear a belt, it would look acceptable. It looks great on you, for a moment I thought it was a real dress. Thank you for following me, I am following right back. I love pinstripes. This is such a cute buttoned down dress! I adore your fringe bag. I love your shirt dress and the bag is gorgeous. Cute outfit! Beautiful outfit! I specially love your bag, It's so cute! Amazing look!! :) I follow you back!! OH this is such a cute choice for you. I wouldn't be able to get away with it right now, but you pull it off perfectly. Oh i just love the hubby/boyfriend shirt. Well the androgynous outfit still brings out the woman in you. and i love the fringe bag sweetie. btw where is this place? I love your bag Jenniya! some kinda bohemian style. your bag is Amerileather?